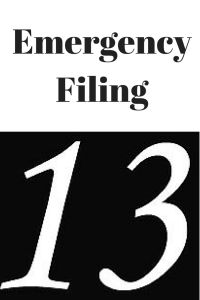 It seems with ever increasing regularity, there is a chapter 13 emergency filing that my office has to complete. It used to be that a Sheriff sale was the main reason for an emergency filing. As long as the case was filed before the actual Sheriff sale took place, the homeowner had the right to reorganize the debt over a three to five-year repayment plan. Lately, I am seeing more and more emergency filings due to drivers’ license suspensions. These are typically caused by failure to pay parking tickets owed to the city of Chicago. Just yesterday, I had a client come in for an initial consultation which lasted approximately 30 minutes. After the consultation, she immediately retained the firm and moved into a separate office to complete her credit counseling session online. While she was completing the credit counseling session, my office rushed to prepare her chapter 13 documents. This involves pulling her credit report, completing the data entry, attorney reviews, and meeting with the client once again to explain the documents and obtain the required signatures. Simultaneously with the client completing the credit counseling, we had her documents prepared. Once they were fully executed, we had the chapter 13 case filed and notice sent out via fax to the Illinois Secretary of State. This emergency type of filing provides an incredible benefit to the client. There is no faster way to get a case filed than to have your consultation, immediately due your credit counseling, and then sign your documents and have the case filed. The great news is that this client has been to two other bankruptcy law firms prior to seeing my firm. In fact, she went to one of the biggest filers in the city of Chicago and received some different legal advice that was not quite accurate. Due to this fact, she continued to seek legal advice and found me based in part on the many Google reviews that are available online. I know that when she left my office yesterday, she realized that she had made a great decision on getting her chapter 13 filed quickly and with my help. If you are someone who has debt owed to the city of Chicago for parking tickets and your driver’s license is either suspended or about to be suspended, you should take immediate action. You can do just like my client from yesterday. You can come into the office for a consultation, and if the information sounds good to you, you can immediately take a credit counseling course and get your case filed. There are certain documents that the client will have to provide such as tax returns and paycheck stubs, however, she is able to provide those in the upcoming days. I did not want to hold up her filing based on the fact that it was an emergency due to her driver’s license suspension. To learn more about your rights under chapter 13 bankruptcy law as it relates to parking ticket debt owed to the city of Chicago, you can contact the office directly at 847-520-8100. The consultation is always complementary and the advice can change your financial life.